Day 144: A Jaded View from the Mountain . . .
We have seen a lot in the last 32 years. As wide-eyed college graduates, we intended to set the world on fire, and we would have except that the government banned burning. But, we didn’t let that stop us–we decided that we’d make a difference by working even harder to help our place in the world be better. The only problem was that the government increased our payroll taxes and we paid for our hard work. But, we didn’t let that stop us–we got married and bought a house–something that was called ‘living the American Dream’ in our formative years, and when we did that, we found out that the government was going to penalize us for being married and, other than interest on our loan, we were going to lose all of our other deductions as a couple. But, we didn’t let that stop us–we decided that we’d make a difference by starting a family to help make the world a better place, enrich our lives and foster the future of our country. The only problem was that because we BOTH had jobs, we were subject to more taxes and the deduction for dependents-while nice-really didn’t help us because we didn’t have enough deductions (er, children) to really make it count. But, we didn’t let that stop us-we decided that we wanted our kids to go to the college of their choice, so we’d make sure that they could not only find their school but make sure they could attend. The only problem was that by the time they were ready to go to college, the government was so overburdened with debt that the first thing Congress cut was student loan coverage. As we look out from the mountain top, sometimes we get a jaded view on things. It seems that today, you’re rewarded for NOT working, and PENALIZED for working–and paying taxes and doing (mostly) what’s right. We look at what’s right and the government tells us that’s not right, and we look at what’s wrong and the government rewards. Hmmmm, we were brought up in a world that rewarded what was RIGHT (correct) and punished what was WRONG. Ok, so when did the rules change? When did it become okay to have the government become the largest employer over private industry? When did it become okay to increase what you take from those who earn more just to give it to those who refuse to work and earn less? Jaded? You ask are we jaded? You better believe it we’re jaded. . .something in the washing machine is screwed up when those who have worked hardest (even if they haven’t worked hardest) and now have to turn over a larger share of what they’ve earned to those who DON’T, WON’T or care NOT to work. We’re sorry. . .that is NOT the America we grew up in. . .it’s NOT the AMERICA our parents grew up in. . .and it’s NOT the AMERICA that we learned about in history class. The train is WAY, WAY, WAY off the tracks, and it falls on ONE simple problem—-GOVERNMENT. Tonight–getting down from the soap box–we enjoyed a terrific Cab from Sonoma County. 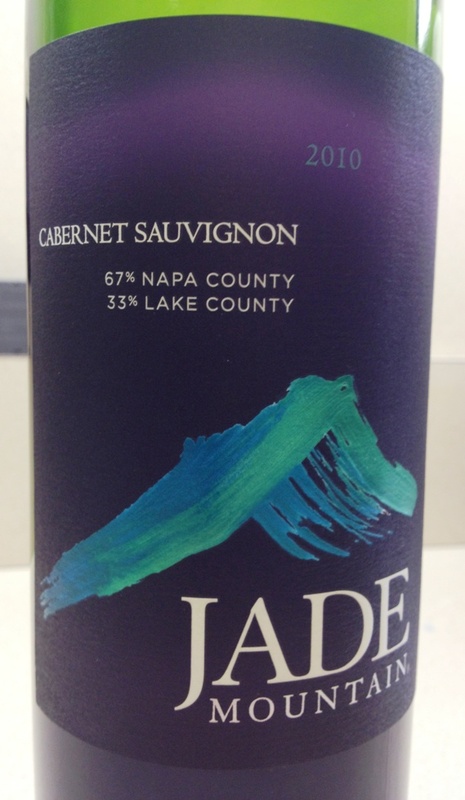 Our 2010 Jade Mountain Cabernet Sauvignon was WAY better than we expected it to be–and not sure what we were expecting, but this wine delivered more than that!! On the nose we definitely enjoyed aromas of violets, chocolate, mocha and red fruits. . .what made it better was the longer the wine was opened, the better the nose! Upon tasting, blueberries and red cherries combine with a hint of leather and vanilla–what a terrific combination of flavors. Each of these intensified as the wine stayed open. Now, typically for a value-priced wine like this (we paid less than $13 a bottle), you’re going to want to enjoy it all rather than pumping it up or trying to save it. Typically, they won’t hold up overnight, so enjoy it with lots of friends, but don’t let it go to waste! The fruit is sourced from 67% Napa County grapes and 33% Lake County grapes–in ‘normal speak’, this wine has a pretty good lineage behind it–both counties have extraordinary fruit when it comes to cabernet grapes, and while this wine may not be from ‘name’ vineyards, as a value-priced wine, it’s pretty darn good. Don’t just take our word for it, go and buy some–we got ours at Twin Liquors; you can find yours at your favorite wine shoppe! So, we may have been a little harsh at the outset tonight. We have both been raised to believe that a hard days work earns a hard day’s pay. As (our perception) the country gets softer, the premise becomes less about a hard day’s work and more about an easy pay day. Fundamentally, this flies against everything that this country was founded on–go ahead and study your history. Tell us where the government takes away the wealth to redistribute to those who don’t work? Is that capitalism? Is that democracy? Enjoy your favorite wine responsibly (while you can) and remember to recycle whenever possible. Categories: Uncategorized | Tags: Jade REd Wine, Oak, VAnilla | Permalink.